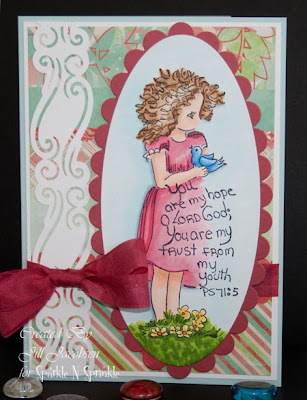 I've been playing alot with my Copics lately...just practicing shading:) I love these Christian stamps from Sparkle N Sprinkle and will share some more with you that I have colored recently, they are retired stamps but Margaret is bringing them back for a limited time. I am using the acetate templates that come in the Shadows & Shading book from Marianne Walker. The seam binding ribbon is also colored with the Copics. Coloring is a relaxing activity to do in the evening.